An unmanned Russian cargo ship that missed its firstchance to dock at the International Space Station last week tried again Sunday ?this time successfully linking up with the orbiting lab. The Progress 38 cargo ship docked flawlessly at 12:17p.m. EDT (1617 GMT) while flying without the safety net of a remotecontrol system that allows cosmonauts inside the space station to take commandof incoming supply ships using a joystick should they veer off course. The successful docking comes two days after the Progress38 cargo ship's first faileddocking attempt on Friday, in which the spacecraft sailed clearpast the space station after aborting its delivery run. 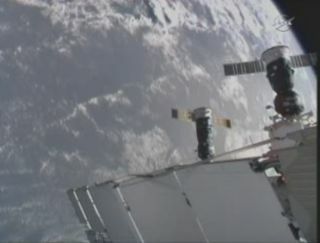 "No doubt a sigh of relief on the part of theRussian control team," NASA commentator Rob Navias said in a NASA TV broadcast after today's smoothdocking. The orbital rendezvous occurred 220 miles (354 km) aboveEarth as both spacecraft flew over the point where the borders of China, Kazakhstan, Mongoliaand Russia meet. The Progress38 supply ship launched Wednesday and delivered 2.5 tons of new equipment,fresh food and other supplies for the space station's six-person crew. "Congratulations on the successful Progress docking,"flight controllers at Russia's Mission Control center near Moscow told thestation crew. Russian engineers suspect it was interference between theProgress vehicle remote control system on the InternationalSpace Station and a TV camera on the space freighter that forced theincoming spacecraft to abort its first approach on Friday. Instead of docking to an aft berth on the station'sRussian Zvezda module, the Progress 38 cargo ship flew by at a range of about 3miles (3 km) to a point about 186 miles (300 km) in front of the space stationuntil another attempt could be made. For Sunday's docking, Russian flight controllers opted toforgo any use of the remote control system, called the Telerobotically OperatedRendezvous Unit (TORU). Instead, they checked and rechecked the Progress 38's autonomousKurs navigation system, as well as its backup system, to make sure thespacecraft was completely ready to dock itself at the space station. "Everything was tested extensively yesterday,including the primary and backup systems," Navias said. Like Russia's crew-carrying Soyuzspacecraft, the unmanned Progress freighters are designed to fly themselvesto the space station using the Kurs navigation system. Soyuz spacecraft can beflown manually by cosmonauts from inside the vehicles, while Progress can beguided in using the TORU system. Both spacecraft have a long track record for reliability,though some have had to be guided in by cosmonaut every now and then. The lastProgress to be docked under cosmonaut control arrived at the station on May 1. "It is a bitsurprising," former NASA astronaut Leroy Chiao, a former space stationcommander, told SPACE.com of the recent Progress malfunction. "Thesevehicles are very reliable, and the operations for getting them to stations arequite mature." Sunday's cargo ship arrival at the International SpaceStation also occurred on the Fourth of Julyholiday in the United States. As both a weekend and a U.S. holiday, the station crewhad expected to have the day off, but worked through the Progress 38 ship'sarrival instead. Of the six people living on the space station, three areAmericans and three are Russians. One of the station's American crewmembers, NASA astronautDouglas Wheelock, sent July 4th greetings to Earth to mark Independence Day inspace. "In celebration offreedom and liberty?Happy 4th from the [space station's] Russian Segment! "Wheelock wrote in a post on Twitter, where he is chronicling his missing underthe name Astro_Wheels. The station crew will open the Progress 38cargo ship later today to begin unloading supplies, NASA officials said.